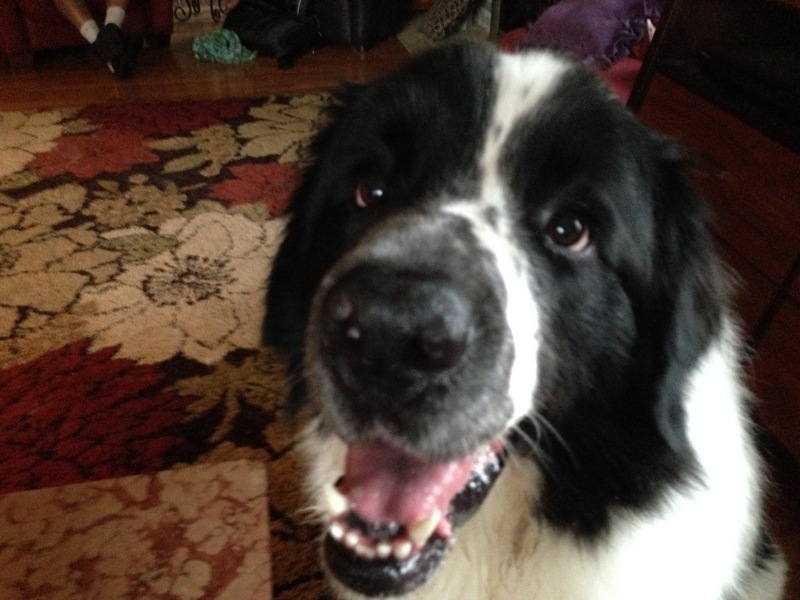 Woody is a one and a half year-old Great Pyrenees / Newfoundland mix who barks a lot and doesn’t always listen to his guardians and sometimes knocks them over due to his lack of respect for their personal space. When I arrived for the session Woody met me at the door and gave me a good long sniff. I remained right inside the front doorway allowing the dog to sniff me as this is the proper way for a dog to first meet a new human. Only after Woody finished his scent introduction and walked away did I enter the home. I sat down with his guardians to discuss the session and what they hoped to accomplish. One of them seemed on the fence about me and asked a few questions about the results he could expect and the methods I intended to use. I made a joke about having a doubter in the house at which point he quickly rebutted my statement to make sure I didn’t take offense, which I did not. Anytime you’re bringing anyone into your home to work with you and your dog you need to feel completely comfortable about the situation. While I have a great reputation well earned by the results I’ve gotten for my clients, I never take offense to anyone asking questions about my methods or how I work. Unfortunately there are a lot of people out there who have watched a television program or gotten into their head that they are a dog trainer when they really don’t have the knowledge, skills or temperament for the job. Always rely on your guts and if something is telling you something is wrong ask the person, about them about it and before you hire anyone, always do some research. Whenever anyone is curious about my methods I direct them to my website or Facebook page where I offer these detailed summaries or case studies of the dogs I have worked with. Most of my clients post a comment underneath the picture of their dog which makes it easier for people to check up on me, my former clients or obtain references on their own. After going over the session and answering all the guardian’s questions, we got started. I could instantly see that we needed to incorporate some rules, boundaries and structure to help Woody start to see and identify himself as being a follower in the household. Exhibit A was his complete disregard for the personal space of any of his guardians. 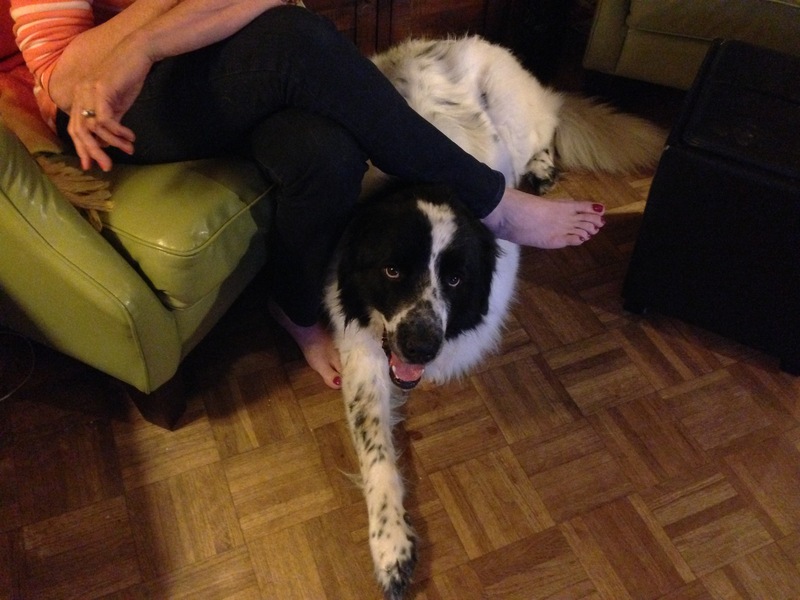 As a nearly 100 pound dog, he wasn’t jumping up on their laps, but he was flagrantly invading their personal space and leaning against them. When a dog shows no respect for the personal space of the guardians it’s a clear indicator that the dog does not respect them as leaders or authority figures. It was easy to see why Woody violated their personals space like this. Each time he did, the guardian would immediately start petting him. This petting actually rewards the dog for invading the person’s personal space. In effect, the guardian had trained the dog that invading a human’s personal space was the way top ask for affection. I suggested that they start to stand up when Woody is walking over or gets too close. If standing up didnt stop him, the next step was walking towards Woody to get him to move away. It took a handful of corrections from both guardians before the dog started to stop invading their personal space. But eventually Woody understood what they were asking and started to sit on the floor a foot or two away from them. As soon as Woody sat down at this distance, I made sure to have the guardian immediately reach over and start petting him while repeating the command word of sit. By immediately providing this positive reward when the dog sits in front of a human, we can help recondition the dog to think that the way to get attention is to sit politely a few feet in front of a human. Once Woody figured out the personal space bubble, I went over a few leadership exercises and different ways of communicating with him. Like many dog guardians, Woody’s parents often reprimanded him verbally when he barked. But when a human verbally disagrees with a dog while it is barking, the dog actually interprets their yelling to stop as agreeing with its barking. To help them disagree in the future, I went over a number of nonverbal communication methods that Woody’s guardians can use instead. Not only will these methods work to discourage him from barking, they can also work when the dog is getting too close to a member of the family. Right as I was finishing going over these nonverbal ways of communication, one of the guardian’s children arrived with her newborn baby. As soon as Woody heard someone at the door, he immediately got up and started rushing towards her. I stood up and used my body language and movement to communicate that he was to keep a respectable distance away. In the past, Woody had gotten overexcited and rushed over, sometimes bumping into family members in the process. Obviously bumping into a mother holding a newborn is something Woody needs to learn to avoid. After blocking Woody’s initial approach, I lingered in the area and continue to disagree or block him every time he attempted to go around me to investigate the new arrival. He would heed my block, then after pausing he would try again. Only after Woody had settled himself down and stopped trying to get past me did I invite their daughter into the living room with her child. The baby was in a carrier which she placed on top of one of the chairs in the living room. As soon as she did this, Woody started to approach the chair and baby. I immediately made a sound to disagree, then use a body movement to communicate I wanted him to give them plenty of space. After a few corrections, Woody sat down a respectable four feet away from the baby. We all sat down in the room and started to discuss the situation and progress so far. Their daughter was impressed with how much calmer Woody was and how he was able to keep his distance. But after a couple of minutes, one of Woody’s guardians mentioned that while the progress was great to see, one of her real concerns was that Woody wouldn’t respect the toddler when it crawled around on the floor. I invited their daughter to place her baby on the floor so I could show them how to communicate to Woody that he was supposed to keep a respectable distance from the baby. 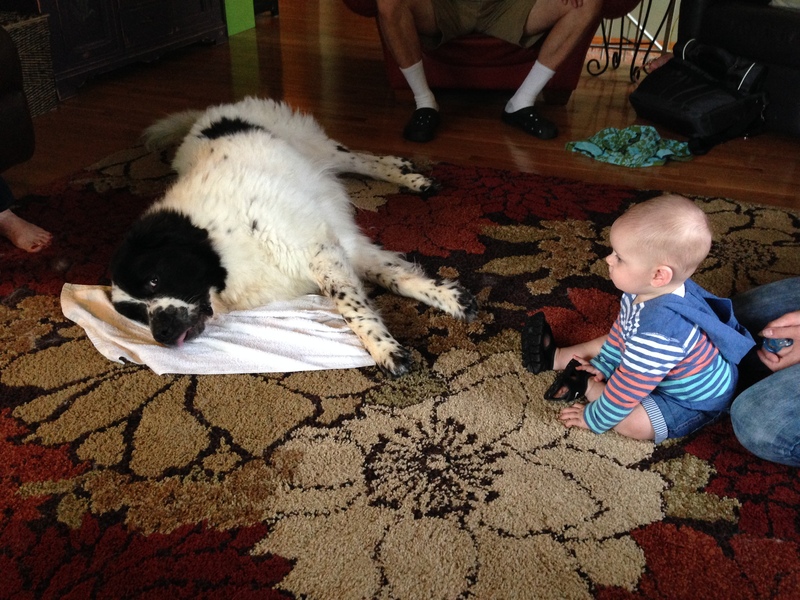 My goal was to have Woody stay at least three feet away form the baby on his own. As soon as the baby was on the floor, Woody got up and started to move over to where her mother laid her down. This time, I was able to get him to stop moving towards them by using a verbal cue alone. Woody stopped and stood in place three or four feet away from the baby while watching intently. After a few moments he sat down, then layed down on the floor on his side three feet away from the baby. Enforcing boundaries like this in various situations will lead to Woody’s understanding that he needs learn to keep a respectable distance from any human. Obviously it’s okay for the dog to be interacting with humans, but it needs to be on the human’s terms, especially due to Woody’s size. Next I had one of Woody’s guardians leave through the back door so that he could pretend to be a guest arriving. 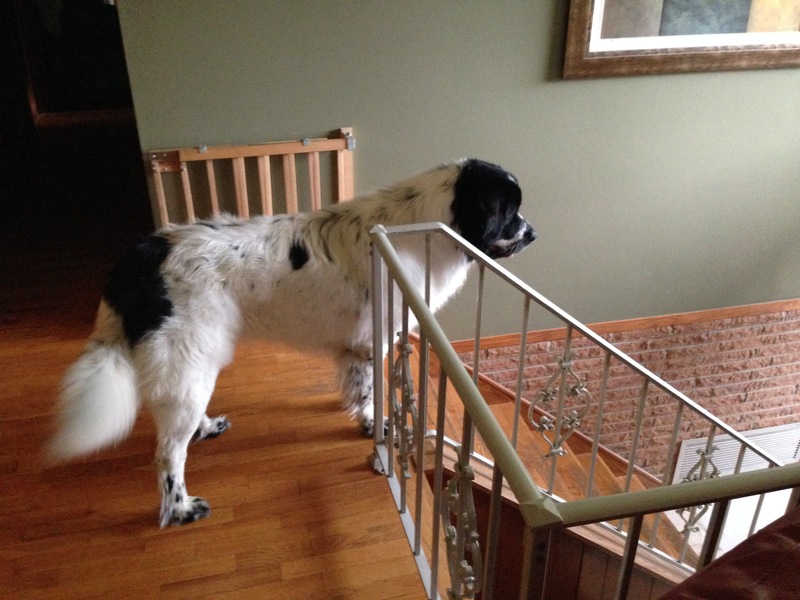 Because the family lives in a split level house, I suggested that the dog have a rule that it is not to come down any of the steps from the top level when there is a knock at the door. I sat in the living room with Woody’s other guardian and we waited a few minutes to try to make it as realistic as possible. As soon as Woody heard the doorbell and knocking, he got barking and rushed over to the door. I had his guardian watch while I answered the door to show her the proper technique. I got up from my chair and walked casually to the door. I ignored Woody’s barking and continued down the stairs until I reached the front door. Once I was at the door I turned so that my back was to the door and my front was facing the dog. I took a deliberate step directly at Woody which caused him to move backwards. I continued walking directly at the dog with the intent of moving the dog away from the door. and back up the stairs. I call this reverse herding. As soon as Woody was on the top level of the stairs, I stopped walking up and remained in place watching the dog. I wanted to make sure that Woody remained stationary before I started moving backwards to the door. I kept my chest facing Woody and walked down the stairs backwards to ensure that he had my full attention. Standing with your front facing the dog is the most authoritative position a human can assume. I made sure to keep my front position facing Woody as I reached over to jiggle the door knob, then the deadbolt then slowly cracked open the door. I paused between each step and corrected Woody each time he started down the stairs. 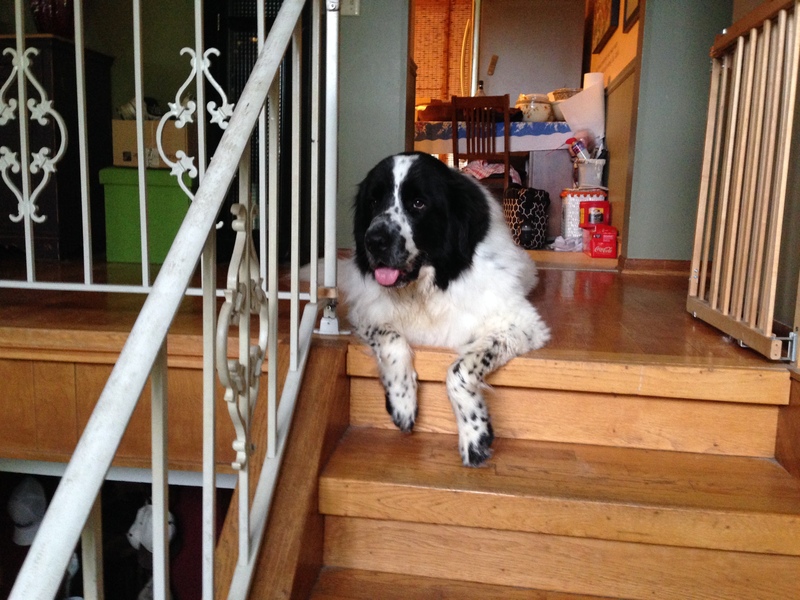 By consistently reacting to the dog’s movement the second he started to come down the stairs, I was able to communicate that he was to stay at the top of the stairs when a guest arrived at the door. I had Woody’s guardian go back outside and repeat the knocking exercise so that his wife could practice answering the door using the same technique. This time Woody reacted far less energetically as soon as the knocking started. He also stopped himself at the top of the staircase on his own waiting for his guardian to answer the door. As soon as she started to jiggle the doorknob, it triggered a barking response from Woody, however it was a much milder response. She repeated the process of jiggling the door knob, then the deadbolt then cracking the door. She paused each time Woody started to react and corrected him the same way I did. By the time she was ready to open the door, Woody had laid down at the top of the stairs on his own. I suggested that his guardians practice this exercise with each other when they get back from trips outside of the home. If they consistently apply the same approach each time someone knocks, it shouldn’t take Woody long to start staying at the top of the stairs on his own. By the end of the session, Woody was much calmer, was following the commands and corrections of his guardians on his own and was showing good respect for their personal space. It will take supervision, timely corrections and enforcement of the new rules to ensure that Woody understands and respects the new boundaries and limits. But now that his guardians are communicating with him in a way he understands and respects, the progress should be much faster.